If you are unable to work due to an illness or injury, you may be eligible for long term disability. Our long term disability lawyer can help you collect maximum benefits under your employer-sponsored (ERISA) insurance policy. According to research, one in eight workers will suffer a disability lasting five years or longer during his or her lifetime. The average long-term disability claim lasts for nearly three years, and the chances of suffering a disabling injury or illness while you are of working age are approximately one in four. In other words, long term disabilities are far more common than most people realize, and this is why it is important to have long term disability insurance. If you work for a private company or government agency, you may have long term disability insurance through your employment. Most employer-sponsored long term disability policies are governed by the Employee Retirement Income Security Act (ERISA), a federal law that provides important protections for sick and injured workers. Unfortunately, despite ERISA’s protections, many disabled workers struggle to collect long term disability benefits. Employers and insurance companies routinely deny sick and injured workers’ claims, sometimes legitimately, sometimes not. Due to the complexities of long term disability claims and the legal consequences of mistakes during the process, if you need to file a claim it is a good idea to have an attorney. At Rue & Ziffra Law Offices, our attorneys can use their 180+ years of combined legal experience to help you collect the benefits you deserve. Our firm has been representing individuals and families in Volusia and Flagler Counties since 1976. We are intimately familiar with the complex issues involved in long term disability cases, and we know what it means to secure benefits when you are unable to work due to an illness or injury. With our team approach and personalized legal representation, you can feel confident knowing that we are doing everything possible to help you collect maximum benefits as quickly as possible. Even if you have been diagnosed with a serious illness or injury, collecting long term disability benefits is not an easy process. Different insurance policies have different requirements, and disability insurers will look for any excuse to deny claims for benefits. Our experienced legal team can take the stress and uncertainty out of your long term disability claim; and if necessary, we can take legal action to protect your rights. Q: What is long term disability? In broad terms, long term disability is insurance coverage that pays benefits to individuals who are unable to work due to serious illnesses and injuries. However, what constitutes a “disability,” and what constitutes “inability to work,” can vary from one policy to the next. For example, some policies only provide coverage if you can demonstrate that you are fully unable to work. Others, only require a showing that you are incapable of “substantially performing” your job duties. Likewise, some policies only provide coverage if you are unable to work in any occupation, while others will pay benefits if you are unable to find work in your chosen career. Q: How do I obtain a long term disability insurance policy? Many people have long term disability insurance through their employment. Private and public-sector employers often offer this as a benefit to their workforce. If you do not have access to group long term disability insurance through your employer, you can buy this insurance on the open market. These individual policies tend to be more expensive (and they are not governed by ERISA); however, they may offer more options regarding the types and amounts of coverage that are available. Q: Who determines if I am entitled to benefits? When you file a long term disability claim, the insurance company will decide if you are eligible for benefits. Once again, different companies have different standards, and what it takes to prove that you are disabled will depend on the specific terms of your coverage. However, insurance companies are not free to approve and deny disability claims as they so choose. They must abide by the terms of their policies; and for employer-sponsored plans, they must also abide by ERISA’s requirements. If you need to file a long term disability claim, our attorneys are happy to review your policy to determine what is required for you to start receiving benefits. Q: Can I file for long term disability and Social Security disability? Yes. In fact, if you are eligible for both types of coverage, you may be required to file for Social Security disability under the terms of your long term disability policy. Private disability insurers have the right to offset long term disability benefits against Social Security disability insurance (SSDI) benefits, so they will typically mandate that workers to try to maximize their SSDI. Q: What is an “elimination period”? 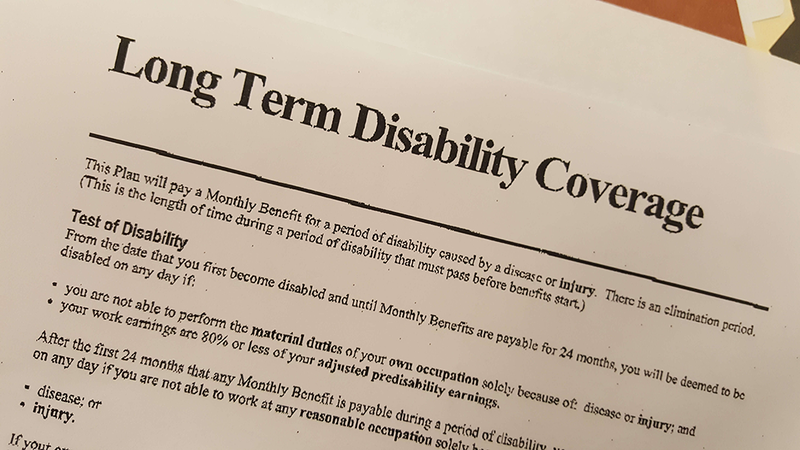 When you suffer a disabling injury or illness, you are not eligible to begin receiving long term disability benefits initially. Most policies have an “elimination period” of 90 to 180 days during which you must exhaust (or “eliminate”) the other sources of income you have available. This includes sick leave, paid time off (PTO), and short term disability benefits. Q: How much of my salary will long term disability insurance pay? The specific benefits available to you will depend on the terms of your long term disability policy. Generally speaking, however, most policies pay somewhere in the range of 50% to 80% of your weekly wage or salary. Long term disability insurance plans typically have maximum benefit amounts as well, so you may be entitled to less if you make more than the average worker. Q: What is the time limit for receiving long term disability benefits? The duration of your benefits will also depend on the terms of your policy. Your benefits will end if you are no longer disabled, but insurers will typically impose maximum benefit durations as well. How Can Rue & Ziffra Law Offices Help? Any time you are dealing with an insurance claim, it is a good idea to have legal representation. The insurance companies have claims adjusters, investigators, and lawyers who get paid to ensure that policyholders only get paid if it is absolutely clear that they are entitled to coverage. If you try to handle your claim on your own, you are putting yourself at a disadvantage. At Rue & Ziffra Law Offices, we can make sure you are treated fairly, and we can help you avoid settling for too little or having your claim unjustly denied. If you would like to speak with an attorney about your long term disability claim, please contact us to schedule a free consultation at one of our nine convenient office locations in Volusia and Flagler Counties. Our phones are answered 24/7, so call (386) 788-7700 now; or if you prefer, you can let us know the best time to contact you and we will be in touch at the first available opportunity.